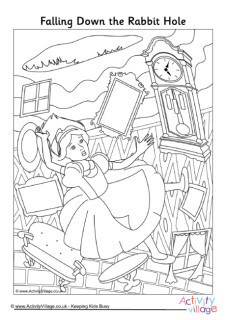 We have a fun collection of Alice in Wonderland worksheets here, all of which are designed to add to your child's enjoyment of the stories rather than be a chore! Have a go at our character studies, print out our story paper, or grab the colouring pencils and see what you can make of the picture gallery! This Alice story paper comes in both black-and-white and colour, and is a fun way to encourage children to talk about Alice's character or to retell the story in their own words. You could also use it to copy out some of Alice's words. Kids can use our story paper to write about the croquet game in Alice in Wonderland. There's plenty to prompt them in the colouring page! Use this story paper to write about the Queen of Hearts, to copy some of her words from the book, or to retell her part in the Alice in Wonderland story. What do you think makes the White Rabbit tick? Apart from his clock, that is! Use this White Rabbit character study to find out.